First, bring up your tablet propoerties, should be in the control panel. Pretty self explanatory. the far left key is my unlimited undo key. All you have to do is select keystroke, then type in ctrl alt and z as if you were using the photoshop hot key. the same goes for the zoom in and zoom out, and the pan scroll you just hold down and drag your pic wherever. This I thought was ingenious when my boyfriend showed me, instead of the touch strip being zoom in zoom out, he used the hotkeys for brush size. While using the standard brush tool, clicking alt will get you the eyedropper. After I block in rough colors, I am constantly picking colors and painting almost simultaneously, since the button is right next to my freaking thumb. Right click will bring up the brush options so you can choose different brushes and sizes (which you won't have to with the magic toughstrip thing!!). Maybe i'm just behind on the times or whatever, but maybe one out of the 484.23 of you has a use for this. - The first tool is how you want to tilt the tablet, for portraits or something. 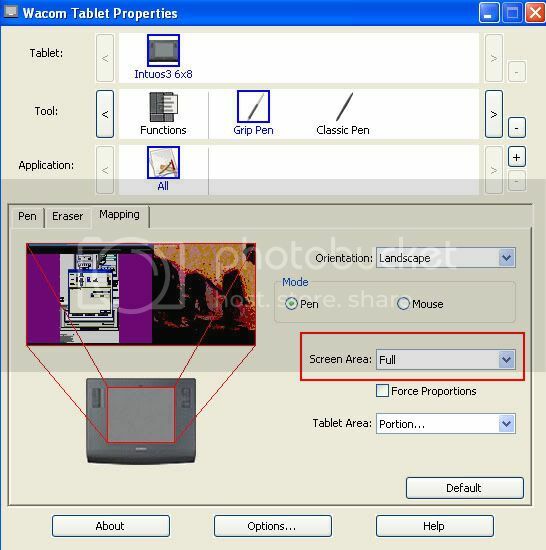 - The third option is the same thing as the second one, but with the tablet instead of the monitor. heh finally a use for the touch strips! I usually just disable them because I accidentally brush them sometimes causing my view to fly all over the place. I think I'll keep my right hand side touch strip disabled though lol.